Manhole covers can be safety critical, in certain circumstances failure or misuse could lead to injury or loss of life. With this in mind our products incorporate features that help minimise safety risks. As well as optimising frame stiffness, rib position and design, the Centurion range has additional unique features and benefits. Manufactured from Ductile Iron, our castings have a much superior strength to weight ratio than traditional grey cast iron. These significant weight savings could not be achieved with less sophisticated materials. At Civils and Lintels we work with Wrekin to manufacture our Centurion range of castings, manhole covers, access covers and access plates. Our access range includes B125 and both Highway and Unite D400 manhole covers, anti-theft gully grates and frames. Centurion B125 Manhole Cover – This single-seal BS EN 124: 1994 B125 Group 2 manhole cover has been designed to combine high strength and light weight. Suitable for car parks and pedestrian areas with occasional vehicle access; it includes additional features such as a slide out cover designed for ease of removal, a patented safety keyway to prevent accidental disengagement and a single seal labyrinth arrangement to help prevent odour escape and water ingress. Also compatible with standard D400 lifting keys. Over frame sizes are available from 550x550mm to 1300x740mm and 1000x1000mm with frame depths from 40 to 75mm. D400 Manhole Cover – The Centurion range of Group 4 Class D400 manhole covers fully comply with BS EN 124:1994 and carry the British Standard Kitemark. The D400 range is suitable for pedestrian areas, carriageways and hardshoulders where cars and lorries have access. Centurion also possesses some innovative design features that mark it out from the competition. These include a patented safety keyway to prevent accidental disengagement during lifting. A patented frame with enlarged corners that help dissipate load. Specially designed cover support geometry reduces movement relative to the frame and therefore seating wear. Indexed covers ensure only one orientation of fitment. Also compatible with standard D400 lifting keys. Over frame sizes range from 730x730mm to 810x810mm with frame depths from 100 to 150mm. Highway Ductile Iron D400 Manhole Cover – Designed and manufactured to meet the enhanced requirements of the Highways Agency’s HA 104/09 specification the Highway range of access covers exceed BS EN 124:1994 requirements and include specific design features required by the Highways Agency. This cover has the same features and benefits as the standard D400 manhole cover with the added benefit of Highways Agency compliance. Unite Ductile Iron D400 Manhole Cover – Simply the best D400 access cover range available on the market. Full of patented design features that combine together to give Unite the longest life and therefore lowest whole life cost of any D400 access cover. Unite exceeds both BS EN 124:1994 and HA 104/09 requirements. For use in a Group 4 Class D400 carriageway environment. Features of this range are as per the standard and Highway D400 covers as well as Patented Framegrip© mortar gripping system built into the underside of the frame that improves the bedding mortar grip to the frame reducing lateral shift and mortar breakdown. Anti-flex© beams increase cover stiffness thereby helping to eliminate at source the main cause of cover seating wear and therefore excessive noise and ultimately catastrophic failure. Over frame sizes are available in 810x810mm, 890x890mm, 1470x915mm and 2075x920mm. 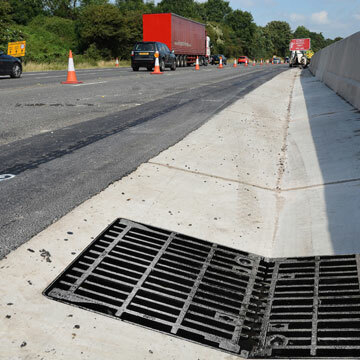 Anti-theft gully grates and frames D400 – For use in a group 3 Class D400 carriageway environment, fully compliant with BS EN 124:1994 and kitemarked by BSI. Complies fully with UK Highways Authority Specification HA/104/09. A unique and patented articulated coupling links two double triangular units allowing the benefits of three point suspension for non-rock stability, together with the advantage of single unit opening. The captive hinge reduces theft risk whilst allowing easy lifting for gully cleaning. Hinging is also reversible allowing the grating to lift correctly for the traffic flow direction. Up to 1100cm2 waterway area. 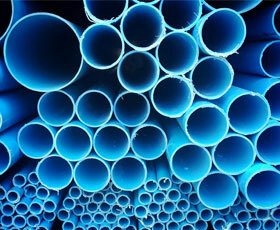 Manufactured from strong and highly durable ductile iron. Anti-theft gully grates and frames are also available in a B125 specification with up to 280cm2 waterway area. Available in 290x290mm and 360x360mm sizes. 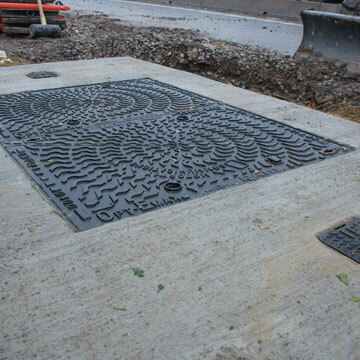 To order manhole covers, grates or frames for your project, contact your local branch.